The Perfect Streak is a relatively new Android sport-arcade game that is based on soccer. This interesting, classic, soccer game requires the perfect combination of reaction and reflexes. It has beautiful, color rich and unique graphics that make the game even more enjoyable. It features easy controls, but exciting requirements. The ball is falling from the top. You need to defend it and stop it from reaching your goal. However, you can’t stop them when you want. The game sets predefined distance which is based around the center. You need to simply tap on the soccer balls when they come in this area. Although this sounds easy, believe us it is not. You'll always thing you can do it, but you will not, and that is really excitingly addictive. The balls will start falling from anywhere and you’ll need great speed and reaction skills if you want to maintain 100% and keep the goal safe. You can play 15 matches and the developers did an amazing job in creating some additional graphic and sound effects. 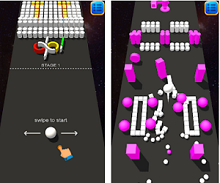 It is indeed an excellent Android arcade sports game that you can get for free on Google Play.